In its efforts to facilitate the the parliamentary voting process, the first phase of which is taking place in Egypt today and tomorrow, Google has set up several tools for voters who have access to the Internet, giving them a central place to go for information. As Egyptians made their way to the polling stations in several major Egyptian cities today, Google was right there with them, offering a platform and tools to make the voting process just that little bit easier. The parliamentary elections in Egypt mark a historic moment in the country’s path, as these are the first parliamentary elections since the uprising that toppled former President Hosny Mubarak. One of the many reasons Egyptians took the streets was because of the blatant fraud that saw most of the seats in the 2010 parliamentary elections go to the ruling National Democratic Party. The elections have been the source of heated debate online, after a week of protests and brutal clashes with the Egyptian police force left over 40 Egyptians dead and thousands injured, and while many promised to boycott the elections, the turn out at the polling stations has been remarkable. Google launched an Elections landing page featuring information, both in English and in Arabic, about the individual political parties running for posts, as well as information on major issues such as the economy, education, foreign relations and social justice. The page also provides visitors with the opportunity to look up their own personal voting information, including their polling stations. All of the information on the landing page is provided by the Egyptian Higher Elections Committee, and with the use of Google technologies, such as Google News aggregation, stories are collected from various sources based on categories. While this service has also been available on the governmental landing page, Google and its technologies were heavily featured in both instances – using Google Maps and Google Elections API to bring these services online for Egyptian voters. YouTube has also been added to the list of Google products in use by Egyptian voters, with Egypt’s very first YouTube Town Hall, Sayyed Qararak launched in cooperation with BBC Arabic and Egyptian satellite channel ON TV. The page features almost 400 videos from both news services hosted on YouTube in which parliamentary candidates speak about their positions, among other things. 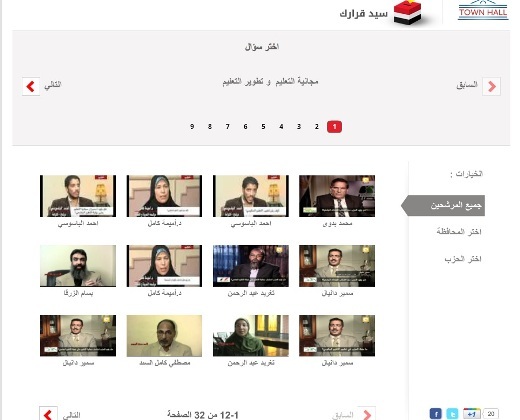 The videos can be browsed by issue, region or political party. In addition to these services, Google has also provided users with a few insight tools giving an interesting view into what kind of information Egyptians are searching for around election time. These include the relative search volume of parties, the spikes in search on ‘elections‘ and lastly a YouTube Trends Dashboard specific to Egypt.